A truly beautiful necklace, this magnetic cross necklace in sterling silver features a special closure - the two halves of the cross come apart and then fasten back together again by use of magnets! This unique design by Apples of Gold Jewelry features a 26 inch chain, and the cross has a texture design that features small ridges. The cross measures 24mm in width and 32.8mm in length, and is made from a stunning .925 sterling silver. "Proverbs 3:5 - Trust in the LORD with all thine heart; and lean not unto thine own understanding." 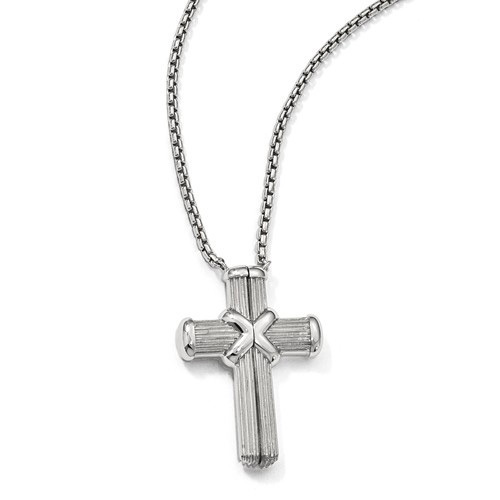 We guarantee our Magnetic Cross Necklace in Sterling Silver to be high quality, authentic jewelry, as described above.